We have written several times in the last year about Middletown Area High School’s sports and their importance to the community. Middletown Blue Raider volleyball player Shelby Luther sings the National Anthem on Monday, Sept. 11, 2017, before her team takes on Trinity. Shelby Luther, Blue Raider volleyball player, sings the National Anthem before Middletown’s game on Sept. 11 vs. Trinity. See the video at www.pressandjournal.com. Here we are again, with fall ready to arrive, the football regular season almost a quarter over, with the MAHS girls tennis and field hockey and volleyball teams in full swing, with boys golf and boys and girls soccer taking the field, with cross country runners sweating it out as temperatures remain in the 70s on most days. The football team is 2-0, continuing its recent streak. No, not every team is as successful. As outlined in our fall sports preview stories, some teams struggle for players. Some teams don’t have the tradition of winning. But it doesn’t take away from what the student-athletes go through to play the sports they love. For many student-athletes, sports is only one way that they express themselves. 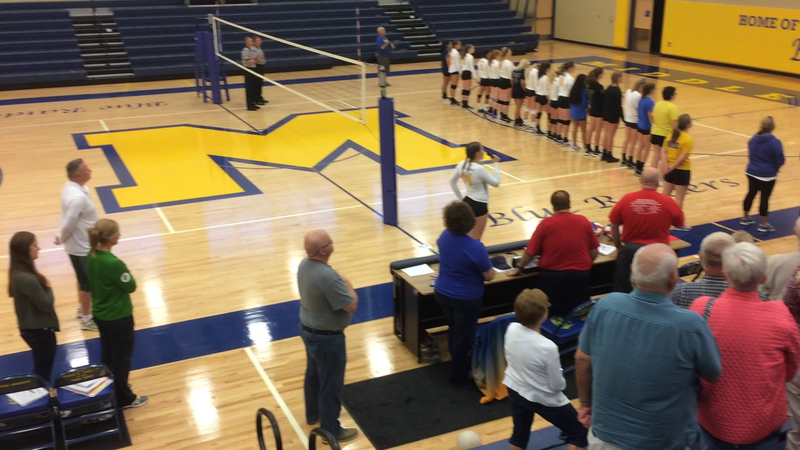 We were reminded of that Monday night when Shelby Luther, a senior on the Middletown Area High School volleyball team, took the microphone to sing the National Anthem — in her uniform — before the Blue Raiders took on Trinity. The beautiful rendition, which you can see and hear at pressandjournal.com, was made more special because of the date — Sept. 11. It’s been 16 years since that fateful day in New York, Washington, and right here in Pennsylvania. Some of the junior varsity players at the game weren’t even born. Look also at the photos from the Meet the Raiders night held Aug. 31 at War Memorial Field. There is a selection on page B6, but go to pressandjournal.com and you can see more photos, which show a number of athletes also are in the band. At a relatively small school such as Middletown, student-athletes are given the chance to excel in many areas. We have purposely called our Middletown Area High Schoolers “student-athletes” in the editorial, because they are students first. As trite as that sounds, it takes a tremendous sacrifice by many of them to balance school work and athletics. It’s not unusual at some volleyball games, for example, to see junior varsity players doing homework in the stands as the varsity plays its match. It’s a delicate balance, between school, athletics and having a life outside of both of those things. That’s why family is so important. Parents sit in the stands, travel to games, adjust their schedules and generally put their children first, as they should, to help their youngsters become better students, better athletes and better people. It’s not just about winning. The Middletown volleyball team didn’t win Monday night. In fact, a very strong Trinity squad won with relative ease. But the team played hard, almost winning the second set. The volleyball game will be forgotten, but people in the stands will remember the rendition of the National Anthem by one of the players, on Sept. 11, a hallowed date for all Americans. And before we forget, thank you to everyone who helps make these sporting events happen, from school employees to volunteers who don’t even have children in the school district. It takes time and planning for games and other events to go off without a hitch. We wish the best of luck to all the student-athletes in Middletown, Lower Dauphin and everywhere across the state and country. Work hard, have fun and learn important lessons from playing sports. You will be better people for it.